Then-freshman guard Najé Murray drives to the basket for two of her 14 points during SDSU's 77-50 win over Presbyterian College. 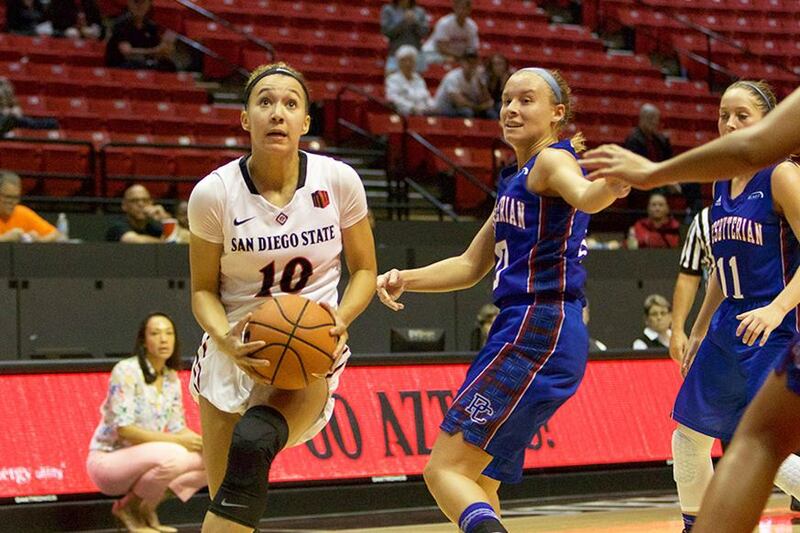 The San Diego State women’s basketball recruiting class is ranked 23rd nationally this offseason, and its new batch of players brings a fresh set of talent to the Mesa. 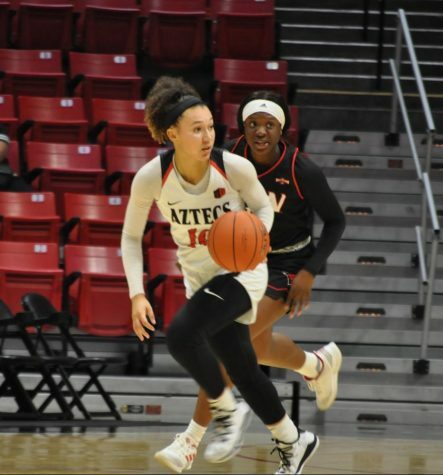 The Aztecs four new freshman guards – Kennedi Villa, Jenay Bojorquez, Te’a Adams, Naje Murray – along with forward Kiara Edwards, constitute the Mountain West Conference’s highest ranked recruiting group. The players bring something valuable to the court that head coach Stacie Terry said isn’t teachable. “What I’m most excited about is how competitive they are. They want to be great, they want to contribute, they want to be in the record books and you can’t teach that,” Terry said. While all have been successful players in their own right, their paths to SDSU basketball varied. For Bojorquez, basketball was just part of the athletic environment she grew up in. As for six foot one, four star recruit Edwards, basketball wasn’t always something that came as naturally. “I was just doing basketball for fun, it gave me something to do…I was horrible,” Edwards said. Edwards outlook on basketball changed after her future high school coach saw her playing and Las Vegas, and started working with her on her game. “When we trained I didn’t touch a basketball for two months, she was in there with tape on the floor, shoes off, showing me footwork and working on different moves,” Edwards said. 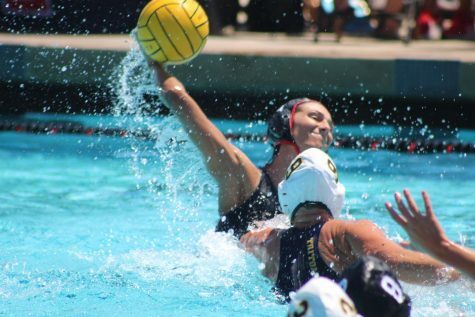 Her hard work would pay off, and she received her first college offer from Long Beach State when she was in the seventh grade. 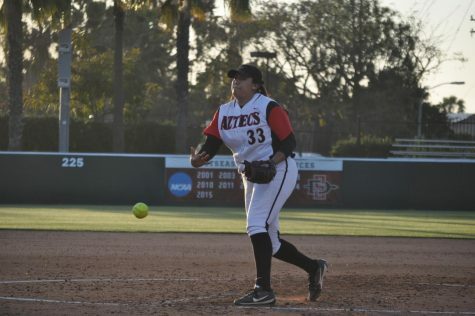 Each player’s high school experience was different, and Villa, who had to overcome serious knee injuries during her junior year, said her former high school teammates still inspire her to this day. 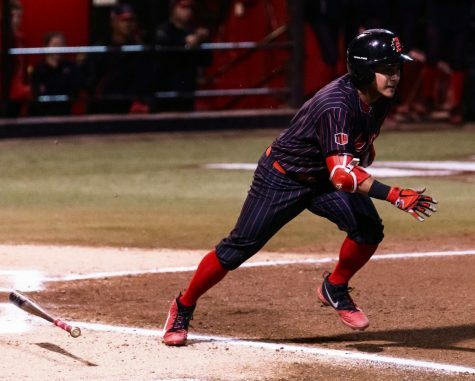 Villa was the first of the freshmen to make an official commitment to SDSU, and witnessed firsthand the cut throat world of college recruiting after her injury. 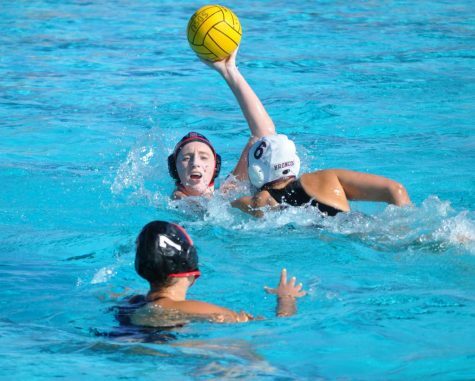 Adams set school scoring records in her senior season at Juanita High School in Kirkland, Washington, and led her team in scoring all four years. Learning that she broke the scoring record was a nice surprise for Adams. The senior year for Murray didn’t go as well, after a devastating knee injury ended her regular season before it began. 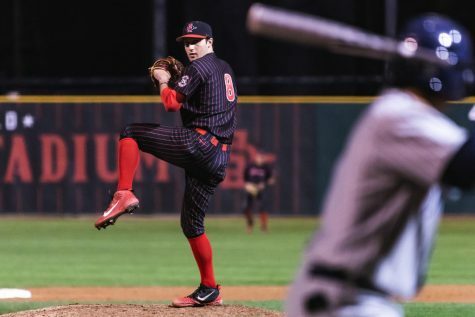 Despite the setback, Murray enjoyed the recruiting process and getting to know the staff and program at SDSU. The girls share a bond that was apparent from the beginning, with many recognizing their official visit as a factor in why they ultimately decided to take their basketball careers to SDSU. “We all committed in the same weekend together which was pretty special,” Murray said. Edwards echoed the same sentiments. 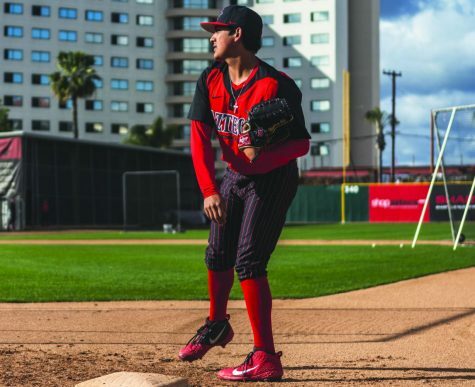 “The reason why I chose SDSU was the family atmosphere. The five of us all came on the same visit and I fell in love with them,”she said. Terry believes the togetherness of this group is obvious, and is something she admires. “I love how close they are. I love the chemistry that they have not only with the team, but within themselves,” said Terry. However this season ends up, SDSU basketball fans have a highly ranked group of players to watch for the next four years. “We’re really excited about this class. Not only what they can bring to us this year, but as we see them develop and grow I think this is going to be five young ladies who will be very special by the time they are seniors,” Terry said. 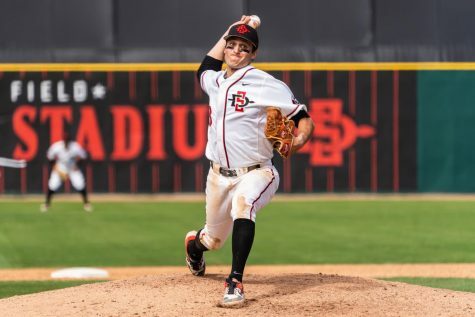 Catch the Aztecs in action on Nov. 3 in Viejas Arena as they take on Cal State Los Angeles in their first exhibition match of the season.